But Ian doesn’t want to help the deadhe wants to be a Healer and help the living. Such a wish is, of course, selfish and impossible. Fossors are Gravediggers. So he reluctantly continues his training under the careful watch of his undead mentor, hoping every day that he’s never Called and carefully avoiding the path that leads into the forbidden woods bordering the cemetery. Just as Ian’s friend, Fiona, convinces him to talk to his father, they’re lured into the woods by a risen corpse that doesn’t want to play by the rules. There, the two are captured by a coven of Weavers, dark magic witches who want only two thingto escape the murky woods where they’ve been banished, and to raise the dead and shift the balance of power back to themselves. Patrick Moody is a middle school custodian who draws inspiration from the spooky night-time halls. He lives with his family in Connecticut. 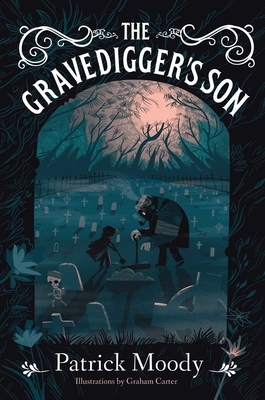 The Gravedigger’s Son is his first novel. Graham Carter is considered one of the most collectible printmakers in the UK, and has worked with a broad range of clients. He lives with his family in Seaford, England.